Pacific Beach (locally known as P.B) is a coastal neighborhood of San Diego, with La Jolla to the North and Mission Bay and Mission Beach to the South. Pacific Beach attracts a large number of young people, surfers and college students. However, known for its excellent dining options and the close proximity to the ocean, it appeals to people of all ages. This is the main center of San Diego’s nightlife scene. The nightlife is the second biggest attraction after the beaches. Pacific Beach has a variety of bars, restaurants and clothing stores. Visit the busy Garnet Street where the nightlife spills onto the streets. Ocean Front Walk/Ocean Boulevard, is a 3 mile boardwalk along the beach, beginning at Law Street and heading down into Mission Beach, ending in Mission Bay. There is a vibrancy to the boardwalk with many shops, bars and sidewalk restaurants and it is usually crowded with shoppers, roller-bladders, pedestrians and cyclists. Crystal Pier, a well-known landmark is a public fishing pier adjacent to the boardwalk at the end of Garnet Avenue. For the surfer, visit Tourmaline Surfing Park. This is a surfing-only beach popular with surfers, long-boarders, windsurfers and kite-boarders. North Pacific Beach is a quieter stretch of beach suited to families with restricted swimming areas supervised by lifeguards. Pacific Beach is the most popular beach destination in the city of San Diego, however offers a variety of things to do beyond the miles of sandy beaches. 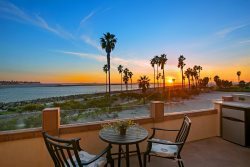 With its close proximity to downtown San Diego, La Jolla, Mission Beach and Mission Bay, SeaWorld & the San Diego Zoo, the options are endless.